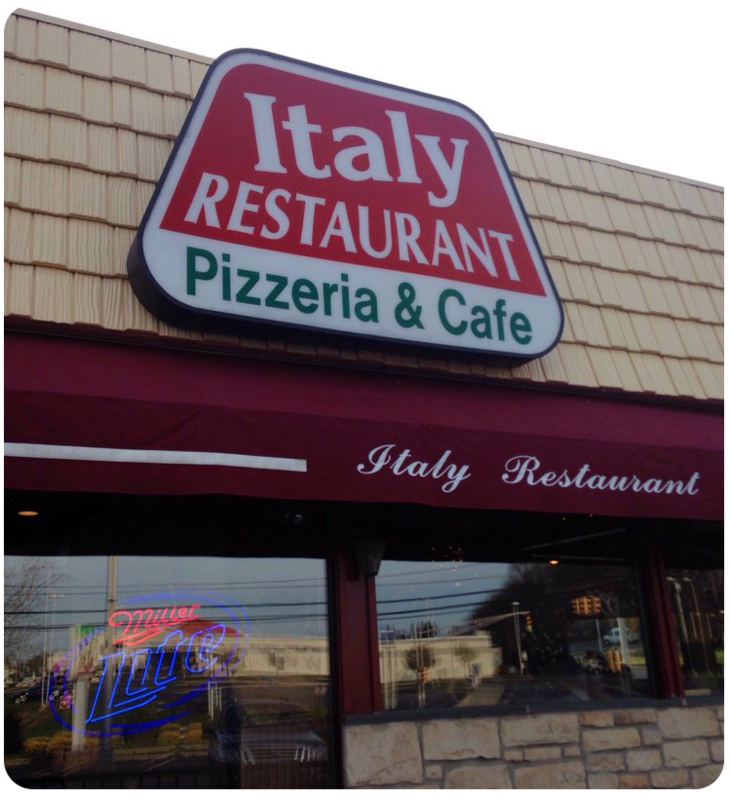 Italy's Restaurant & Pizzeria | Italy Restaurant is a family operated establishment. Clams in a light marinara sauce. Eggplant rollatini, mushrooms, clams, mussles, fried shrimp and mozzarella sticks. Stuffed with prosciutto, served over mixed greens and tomatoes, and dressed with balsamic vinaigrette. Filled with mozzarella and ricotta cheese. 6.95 (sm) $12.95 (lg) Small fillings $.50 each, Large fillings $2.00 each. Steak, onions and mozzarella cheese. Spinach, broccoli, mushrooms, tomatoes and mozzarella cheese. Capicola, ham, salami, and provolone cheese. Ham, salami and provolone cheese. Mushrooms, onions, sweet or hot peppers and sauce. 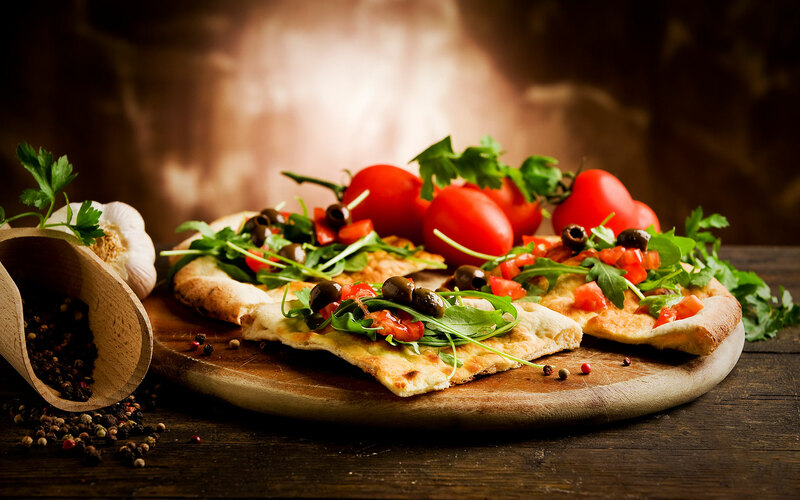 Served on homemade flatbread or Italian bread. Grilled chicken, topped with lettuce, tomatoes, mozzarella cheese dressed with balsamic vinaigrette. Homemade flatbread. Grilled chicken topped with spring mix, roasted peppers and provolone cheese dressed with balsamic vinaigrette. Homemade flatbread. Spinach, portobello mushrooms topped with provolone cheese. Homemade flatbread. Grilled eggplant, roasted peppers, spinach and mushrooms topped with mozzarella cheese dressed with balsamic vinaigrette. Homemade flatbread. Fresh mozzarella cheese, prosciutto, tomatoes, roasted peppers, olive oil and basil. Homemade flatbread. Grilled chicken topped with mozzarella cheese, tomatoes and pesto sauce. Homemade flatbread. Sausage, broccoli rabe and provolone cheese. Homemade flatbread. Egg battered chicken with spinach and mozzarella cheese in a light butter lemon sauce. Homemade flatbread. Spring mix with grilled eggplant, artichokes, roasted peppers, cheese, cucumbers and tomatoes. Romaine and spring mix dried cranberries, sliced almonds, feta cheese and tomatoes dressed in raspberry vinaigrette dressing. House salad with kalamata olives and feta cheese. House salad with marinated vegetables, roasted peppers, hard-boiled egg and mozzarella cheese. Romaine lettuce, hard-boiled egg, roasted peppers, croutons, tomatoes and cucumbers. Calamari, shrimp, chopped clams and mussels. Dressed with olive oil and lemon juice. Scungilli and celery dressed with olive oil and lemon juice. Choice of: Shrimp, chicken or tuna salad over our house salad. Spring mix, roasted red peppers, mushrooms, tomatoes, prosciutto and fresh mozzarella. Grilled chicken, crumbled bleu cheese, raisins, red onions and bacon over a bed of baby spinach. Calamari, shrimp, clams, mussels in a marinara sauce with white wine sauce. Served with your choice of the following pasta: Linguini, Angel Hair, Penne or Spaghetti. $10.95 (lunch) $16.95 (dinner) Whole Wheat Penne $1.00 extra. Shrimp, scallops and chipped clams sauteed in a pink sauce with a touch of cherry wine sauce. Served with your choice of the following pasta: Linguini, Angel Hair, Penne or Spaghetti. $10.95 (lunch) $16.95 (dinner) Whole Wheat Penne $1.00 extra. Shrimp, scallops and chopped clams sauteed in garlic and olive oil with a touch of white wine. Served with your choice of the following pasta: Linguini, Angel Hair, Penne or Spaghetti. $10.95 (lunch) $16.95 (dinner) Whole Wheat Penne $1.00 extra. and Mushrooms sauteed in garlic and olive oil with a touch of white wine. Served with your choice of the following pasta: Linguini, Angel Hair, Penne or Spaghetti. $9.95 (lunch) $15.50 (dinner) Whole Wheat Penne $1.00 extra. Shrimp, sauteed in butter, garlic, lemon and white wine. Served with your choice of the following pasta: Linguini, Angel Hair, Penne or Spaghetti. $9.95 (lunch) $15.50 (dinner) Whole Wheat Penne $1.00 extra. Breaded butterflied shrimp topped with marinara sauce and mozzarella cheese. Served with your choice of the following pasta: Linguini, Angel Hair, Penne or Spaghetti. $9.95 (lunch) $15.50 (dinner) Whole Wheat Penne $1.00 extra. Homemade ravioli stuffed with lobster and served in pink sauce. Served with your choice of the following pasta: Linguini, Angel Hair, Penne or Spaghetti. $9.95 (lunch) $15.50 (dinner) Whole Wheat Penne $1.00 extra. Your choice of marinara sauce or white wine, garlic and olive oil sauce. Served with your choice of the following pasta: Linguini, Angel Hair, Penne or Spaghetti. $9.95 (lunch) $15.50 (dinner) Whole Wheat Penne $1.00 extra. Fried butterflied shrimp served with a side of pasta or fries. Served with your choice of the following pasta: Linguini, Angel Hair, Penne or Spaghetti. $9.95 (lunch) $14.95 (dinner) Whole Wheat Penne $1.00 extra. Atlantic grilled salmon in a light lemon butter sauce, served with a side of sauteed spinach. Served with your choice of the following pasta: Linguini, Angel Hair, Penne or Spaghetti. $9.95 (lunch) $15.50 (dinner) Whole Wheat Penne $1.00 extra. With shrimp and broccoli sauteed in garlic and olive oil with a touch of white wine. Served with your choice of the following pasta: Linguini, Angel Hair, Penne or Spaghetti. $9.95 (lunch) $15.50 (dinner) Whole Wheat Penne $1.00 extra. Shrimp and Asparagus In a light butter sauce. Served with your choice of the following pasta: Linguini, Angel Hair, Penne or Spaghetti. $9.95 (lunch) $15.50 (dinner) Whole Wheat Penne $1.00 extra. Your choice of pasta served with capers, black olives and anchovies in marinara sauce. Served with your choice of the following pasta: Linguini, Angel Hair, Penne or Spaghetti. $9.95 (lunch) $13.95 (dinner) Whole Wheat Penne $1.00 extra. Made with soft 12'' homemade tortillas. Made with soft 12'' homemade tortillas. Ham, salami and provolone. Made with soft 12'' homemade tortillas. Grilled spinach, mushrooms, eggplant, roasted peppers. having a party? catering available! What does Italy Restaurant offer? Having a party? Yes, We cater! Catch the game on TV while you dine! Have a question? Send us a message! If you are looking for catering services please send us your information. We will get back to you promptly.